The U.S. EPA supports raising awareness about environmental issues and encourages community involvement in environmental solutions. In fact, it is directly a part of the agency’s Urban Waters initiative to ensure access to clean waters and surrounding areas by engaging individuals, neighborhoods and local organizations, especially in underserved areas. There is a documented and prevalent unequal distribution of environmental degradation and pollution that disproportionally impacts low-income urban communities and communities of color. The reasons are complex; however, there is evidence that discrimination, inconsistent regulation, and unequal political power play a role. Three projects from different organizations in the eastern United States are using creative methods to educate students about environmental issues in their communities and to empower urban youth to make a difference. While the issues that the communities face are varied, each organization is engaging youth to raise awareness and to create solutions. In 2012, the Center for Urban Environmental Reform (CUER) created Mayah’s Lot, an environmental justice graphic novel and animated video. Rebecca Bratspies (CUNY law professor, director of CUER, and author) and co-creator, Charlie La Greca (graphic artist and author), were driven to create Mayah’s Lot to encourage “environmental awareness and civic engagement” in urban settings. Through the creation and implementation of Mayah’s Lot materials, CUER raises awareness about environmental injustice and offers the means for communities to get involoved. When encountering the youth of New York City (NYC), Bratspies recounts that many believe that the environment is something separate from them. Following the main character in the comic book – a young girl named Mayah – students learn that the environment is connected to where they live and that they can be a voice in the community to stop environmental degradation and advocate for positive changes. Bratspies and La Greca use the Mayah’s Lot materials to lead students in discovering environmental issues that are important to their neighborhood while developing their own comic book heroes and villains (see Mayah’s Lot in Action). Since their development, CUER has worked with nearly 1000 NYC students and trained about 25 NYC public school teachers. Throughout the process, students also learn what it means to get involved and how to effectively have their voices heard in the community. The impact of these resources is far reaching, being used all over the world at universities within the United States, Canada, South Africa, the United Kingdom, Indonesia and Hungary. Incorporating science and history into public awareness campaigns is also an important aspect of the environmental justice movement. The Day Brook Secret Stream project is a Pioneer Valley Planning Commission (PVPC) initiative to implement a green infrastructure plan for the city of Holyoke, MA. Day Brook, which has been buried and piped into Holyoke’s combined sewer system, experiences high instances of combined sewer overflow discharges to the Connecticut River during storm events. Understandably, the community feels separated from this unseen natural resource and subsequently the environmental issue. To engage the public, the PVPC, funded by EPA’s Urban Waters Small Grant program, hosted community workshops in disadvantaged neighborhoods and other events for the community at large. A solo educational workshop took place at the Beaudoin Village Boys and Girls Club, located in a public housing neighborhood that is near the headwaters of Day Brook. In the workshop, the students learned about the history of Day Brook and participated in fun outdoor activities centered around green infrastructure and rain gardens. The PVPC also collaborated with the Enchanted Circle Theater Group to create public art with Holyoke’s Sullivan School. Both a mural and a story walk were created and unveiled in community events. The mural depicts the path of Day Brook through the region and is displayed in the Holyoke Community Field park. The story walk gives an account of Day Brook history as well as the proposed green infrastructure solution. In turn, the urban youth are actively a part of the solution that is being planned for the city. In a similar project, the University of Tennessee, Knoxville (UTK), together with local schools and organizations in disadvantaged neighborhoods, are helping the city create a nutrient restoration plan for Baker Creek. Baker Creek is located in Knoxville and is currently listed on the Clean Water Act Section 303(d) list for impaired waters. Funded by EPA’s Urban Waters Small Grants Program, UTK is working with urban youth to collect water quality and location data in order to create a Geographic Information System (GIS) that can be used by city planners. To effectively engage youth in the project, graduate students created a summer camp entitled “Baker Creek Young Scientists Club” for youth from the Boys and Girls Clubs of Vestal and Montgomery Village. Using skits, games, and interactive 3-D river models, students learned about pollution sources and ways to reduce them. The youth then acted as investigative scientists, collecting water quality data in Baker Creek. Not only did the students work hands-on to collect samples, they also had the opportunity to work with mapping technology by collecting location data that was used to create GIS maps. They also experienced an augmented reality (AR) sandbox, an interactive tool used to visualize topographic maps that was originally developed by the University of California Davis and recreated at UTK. The sandbox simulates how water flow is affected by the landscape and allows students to create and test hypotheses in real time. At the end of the camp, students presented their findings to camp leaders, parents and community members using student-led games, skits and drawings. 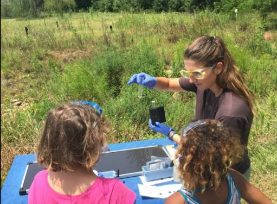 The camp students learned about the Baker Creek watershed and the process of science; moreover, they learned how to use important technology that can accurately inform decision-makers and community stakeholders when making decisions related to water quality restoration. When urban youth are involved in the process of defining and solving environmental problems, they not only learn about their connection to natural resources but also learn how to sustain those resources for future generations. Exposing youth to the processes of scientific inquiry and civic engagement provides them with invaluable experiences necessary to change the prevalent trend of environmental injustice in underserved communities. Further, art and technology can make current public outreach efforts more engaging and impactful. As a result of these projects, the youth are equipped with the tools that they need to make meaningful connections that provide positive changes in their neighborhoods. While the overall goals of each of the three projects is different, they successfully engage urban youth for the benefit of the environment and the greater public good.